Fort Lauderdale, FL – The price of gas took another dip this week, but unless you live in one of the states covered with Rocky Mountains, you may not notice. According to the weekly release from the U.S. Energy Information Administration, the average price of regular unleaded fell only a tenth of a penny per gallon during the week. The average price now stands at $2.15 per gallon, a price that is down a penny from last week’s average, but only due to rounding. Millions of drivers across the Midwest are paying nearly three cents per gallon more than last week, a common happenstance in a region besieged by pricing volatility. The cost of diesel declined again this week, but no more noticeably than regular fuels, as prices only went down a tenth of a penny, on average, according to the E.I.A. The E.I.A. reports the national average cost of diesel is remains at $2.42 per gallon. 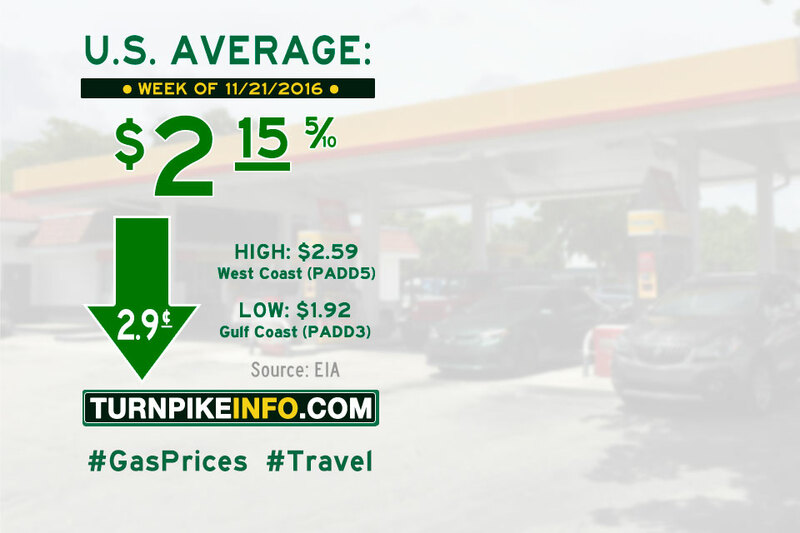 Fort Lauderdale, FL – The price of gas took another dip this week, a consecutive weekly decline that will benefit drivers just as the busy Thanksgiving holiday travel gets underway. According to the weekly release from the U.S. Energy Information Administration, the average price of regular unleaded fell nearly three cents per gallon during the week. The average price now stands at $2.16 per gallon. Millions of drivers across the Gulf Coast and Lower Atlantic states enjoyed price declines of about six cents per gallon, twice the national average. However, prices in the Midwest increased on the week. The cost of diesel declined again this week, adding another two cents to last week’s decline. The E.I.A. reports the national average cost of diesel is now at $2.42 per gallon. Fort Lauderdale, FL – The price of gas took a bit of a dip this week, according to the weekly release from the U.S. Energy Information Administration. 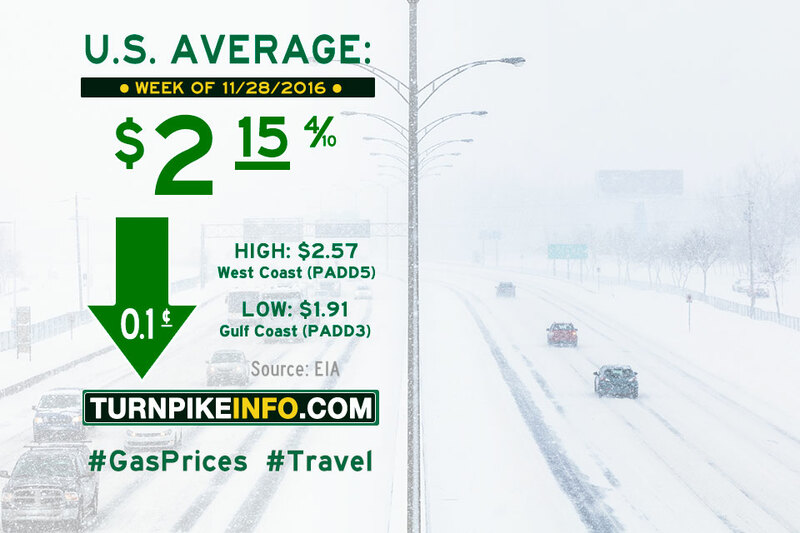 The average price of regular unleaded fell nearly a nickel per gallon during the week, the E.I.A. report shows. The nationwide average now stands at $2.18 per gallon, but millions of drivers across the Gulf Coast and Midwest are paying less than $2.00 per gallon. The cost of diesel took a breather this week, but declines did not match those of regular gasoline. The E.I.A. reports the national average cost of diesel is now at $2.44 per gallon. Fort Lauderdale, FL – The price of gas ticked upward during the week, although prices fell by nearly three cents in the Gulf Coast and Rocky Mountain regions this week, according to the U.S. Energy Information Administration. Even so, a six-cent increase in prices across the Central Atlantic states dragged the average U.S. cost upward by about three-tenths of a penny. Even so, the national average remained at $2.23 per gallon, due to rounding. The cost of diesel pushed down this week, by about a penny per gallon, according to the E.I.A. The national average settled at $2.47 per gallon.